I think I received many Dad Points with this activity. A few weeks ago, we received a Griot’s car cleaning bundle thing in the mail from a friend, and none of us had used it yet. So, naturally, I wanted to use the V70 as a testbed. 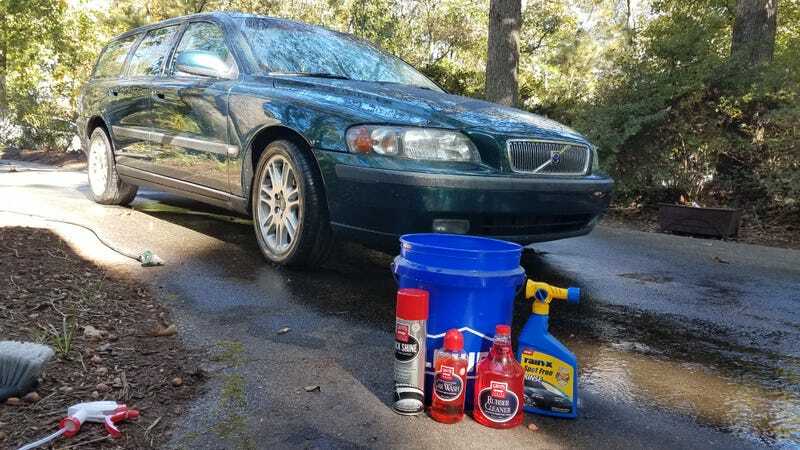 The kit included all what is pictured (except for the Rain-X spot free protection and the Lowe’s bucket, obviously), along with leather cleaner, and wheel cleaner. I didn’t use the latter two products as I couldn’t find the wheel cleaner we typically keep in the shed and I don’t own the cloth necessary for applying the leather cleaner. Like I said, the V70's biggest downfall is the driver’s seat. It is quite worn, yet intact and still Volvo-comfortable, but it just looks very old. Nonetheless, the car looks brand new on the outside now. Also, I had to take it on it’s first Sheetz run. The local Sheetz is just a few miles up the road, but it still gave me time to play with the car a little bit. I did a few quick pulls, and while the car responds fairly quickly, I do notice some turbo lag. I have not driven a turbocharged car at any period of length before, so I’m no expert on how they drive. Now this is something I can get used to. According to the computer in the car, I am averaging about 19.2 MPG. I personally wanted a bit higher, but I knew what I was getting myself into when I bought the car. For reference, the TrailBlazer averaged 17 MPG. I have to teach myself to always put 93 octane in the car, even though my second nature instincts tell me to press 87. I’m loving this car more and more every time I get into it. I cannot emphasize how comfortable the seats are. Last night, I took my friend Giulia (yes, named after the Alfa’s. Her mother is from Milan, mind you) to dinner at the classy Golden Corral and she even said how comfortable the ride was. Let’s just hope that I keep liking this vehicle as I do have to drive it every day for the next few years.